The story is pretty vague, which can be good or bad depending on your preference. Good because it leaves LOTS of room for fan theories. Bad because there are LOTS of people that want a story spoon-fed to them. Basically, you play as “The Knight” and arrive in a town called Dirtmouth. You speak with a few NPCs and go underground, where most of the game takes place. The first area, Forgotten Crossroads, is basically a place to get your feet wet before you jump into the pool that is the HUUUUGE map. Like I just mentioned, the map itself is gigantic. And you don’t even have a map from the start. You have to find Cornifer, the map salesbug, in each area to purchase an incomplete map. In other words, you have to explore, and by doing so map out, the rest of it. Luckily you also get quite a few movement upgrades like double jump, wall jump and dash / air dash. You’re gonna need all these things throughout your adventure. Anything can get frustrating in this game. Be it platforming or “just” a boss fight. But there is no need to be afraid of death here! Unless… you die without retrieving your Shade. The Shade is something you leave behind where you died. It has ALL of your money (called Geo) and restores the ability to fill your magic power up all the way. If you die before absorbing your Shade you do leave a new one behind BUT the old one disappears, along with your Geo. It looks a lot like something made by Tim Burton. I say that because The Knight looks like something straight out of The Nightmare Before Christmas. I don’t know if Team Cherry likes that comparison. I’d like to think they do. Most indies are in an older 8 or 16-Bit style. It’s cheaper and easier to create. Hollow Knight on the other hand goes for a more hand-drawn style and it shows. Every single area you wind up in looks beautiful in its own way. City of Tears looks like a literal City. Deepnest looks like a cave and is probably one of the creepiest places to be. Mainly because of the Corpse Creepers. There’s a large variety of characters. 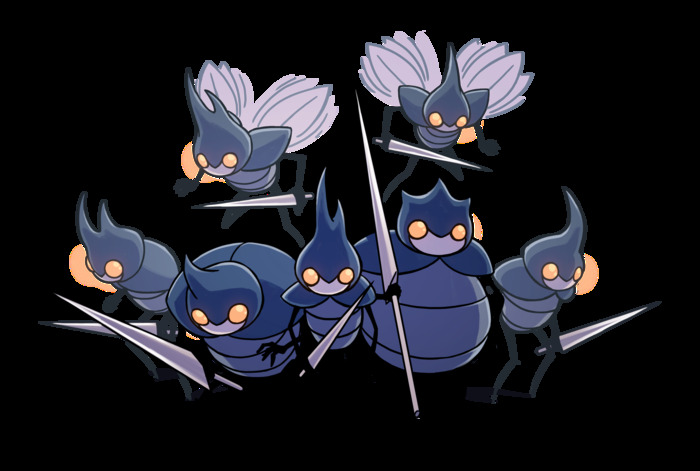 From little bugs like The Knight or Cornifer to bigger ones like Husk Guards or most of the bosses. So far they have released a few DLC packs. They’re all free, which is great! The next one, Godmaster (renamed from Gods & Glory) is going to be the final free DLC pack and is apparently going to be the biggest, most expansive of them all. I’ve also been reading about a DLC Story in which you play as Hornet. I am in love with this game. Seriously. I bought it on the Switch, for $15 and wasn’t really expecting too much. I only saw it during the Nintendo Direct and loved the art style and the bit of gameplay they showed. I think they were hopping around Deepnest. NOW I have put 45 hours into the game and there is still SO much to do! For instance, I haven’t even started The Grimm Troupe yet. That said, I can’t wait to finish the normal content and start The Grimm Troupe. If you are a fan of Metroidvanias I 1000% recommend getting this game!